Where else would 2 passionate Angel Baseball fans tie the knot? At the stadium of course! Two huge baseball fans, a fun crowd, and a unique wedding setting created a truly unforgettable experience for Jayme and Ryan’s friends and family! Years after Jayme and Ryan met in high school, their pasts again collided and they became a couple. Many years later, Ryan proposed and the wedding planning began! Knowing they wanted to incorporate their love of baseball into the wedding, they ventured into perhaps having a stadium wedding. I was thrilled to come on board early on in the planning process to assist the couple every step of the way, I knew this was going to be a wedding to remember! The day started out with the Groom & Groomsmen playing some baseball on the outfield. It’s not every day you get to play baseball on a major league field! What a treat for the guys! The ladies were able to watch the guys on the field as they got ready in the Legends suite above. The sweet ceremony took place on home plate! Immediate family members were invited to sit on the field to watch the couple exchange vows, while the remainder of the guests watched from the Diamond Club seats. Our huge bridal party was lined up along the 1st and 3rd base line, such a cool sight to see on a baseball field! As the couple kissed for the first time, fireworks went off in the background! Talk about a moment! It was a big way to celebrate a big moment that was years in the making! Wanting to have baseball be a part of the celebration, but not the entire “theme”, we incorporated the Angels colors Red, Grey & White into the decor. The Diamond Club was decorated with stunning red roses, grey satin linen, and silver and white accents. A white dance floor and just the right amount of red lighting created the perfect backdrop! A ton of personal touches were incorporated into the day, from a 6 foot tall baseball bat that served as our guest book, to handmade wooden ceremony signs for the flower girls to carry down the aisle. A fun cake topper was the perfect finishing touch to our unique cake, and a warm pretzel late night snack incorporated just a touch of “game day” snacks for the guests. It goes without saying that this wasn’t your “typical” wedding! It was such a joy to be a part of such a unique planning experience with Jayme and Ryan, and watch it all come together on the big day! The couple and their families were more than clients, they became friends and for that I am very thankful! Jayme and Ryan, congrats on such an amazing wedding! Thank you for allowing me to be a small part of it! Here’s to your future…. and to our Angels 🙂 I’ll see you at the stadium! 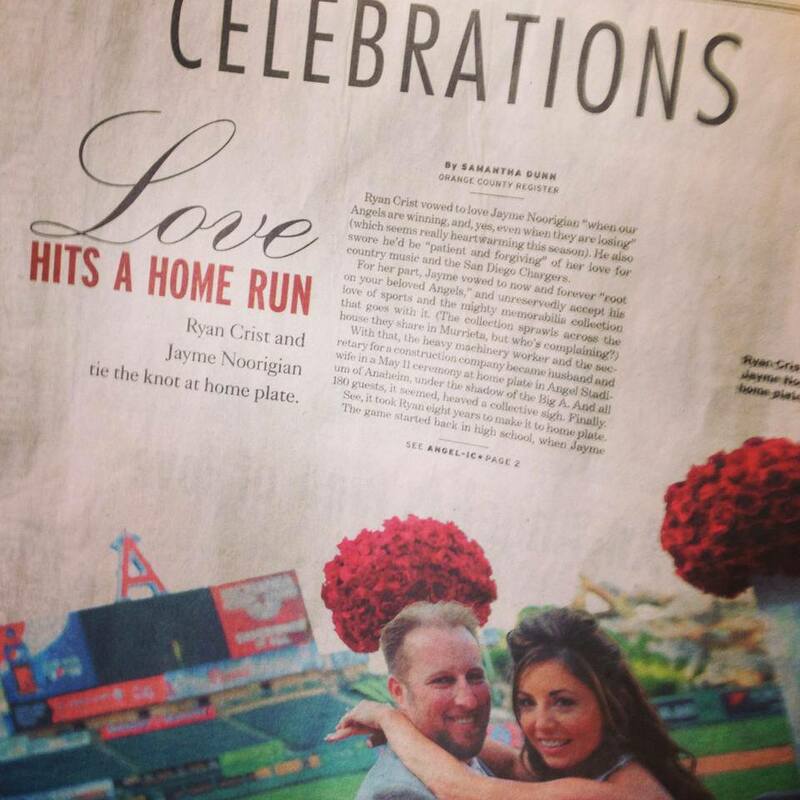 You can also find Jayme and Ryan’s wedding featured in the Celebrations section of the OC Register! Take a look at them on the front page!